Hello Investors, that's the weekly update for GTD about its recent behavior on markets. During the week a -0.81%. Actually the Replication for June is at +3.52%. During the week some sessions have caused a DD on GTD, taking a picture with a daily base checking the alignment during the all, I can say that the loss was created by different components and in particular way from the ones that were more climbing in the last period for performance. It's nothing that goes beyond the common of the Portfolio, I see nothing different than a simple discharge of performance on some pairs by some components. I do not attribute these losses to some recent movements, but some of these have impressed me both positively and negativity. Possibilities to have other trades for the Weekend or by the end of the Day, let's see last movements that will separate us from the Weekend. After it, just one week before closing the semester. Thanks to old Investors and new ones for the Trust. Hello Dear Investors, June is over and so it's time for the Big Update which will include considerations about last Week, Month, Quarter, Semester of GTD. During the Week a + 0.49%. Last Week of June was very imbued of Fog, and for some components of this Portfolio, it was better to avoid some movements. BTW, activity when possible that exploited half some pairs, but it's good the same since the month doesn't count only the last week. Total Replication of June is + 4.03%. June was a good month for some strategies. A balance between various components of the Portfolio that are always looking for more than one single view on Markets has allowed to look for different movements and directions and even if sometimes the system get trapped in some fake directions, June is ended with a positive balance. I will remember those last four weeks as particularly tricky at all, sometimes Directions have been very slow, instead changes of amplitude and power really fast but unclear. Second Quarter of 2018 is ended with a + 12%. A quarter is something which already matters more than a single month, the percentage result is quite positive and very similar to the first quarter of the year. The percentage of DD has always been very low and although April was flat, in following two months the Darwin was able to score new highs. Replication of the Semester is +27.07%. The result was in our opinion not stored in a quiet phase of the market and although some components could do more than they did, others instead performed a little above their average. This balance has led to a truly decent result from our point of view, considered also that max DD was around +- 4% over the period. We continued to work on the general alignment, some minor changes after long observations allowed us to give little improvements to the portfolio, we do not stop and will never stop working on the general alignment because we are always of the idea that it is possible to improve something. A big thanks goes to Investors that have kept balance on GTD during these months, I hope you are enjoying the ride, thanks for the Trust. That's all, waiting the evolution of second semester too, have a nice day! NEW TAB available for all Darwins! It seems that your resistance at 80 investors and 200k aum has been broken ! Dear @CavaliereVerde , you are right, hope for a good breakout eh-eh! Just joking, I believe things come with time and patience. Before I was used to check widgets to look at the AUM per weekly base, this to understand the flow of Investors over some periods, at the post 169 I underlined the cap of GTD about 70-75 Investors with my ugly measurements but now is all under the eyes of all. I hope that this instrument will be useful for investors too. Now they will be able to watch 2 things more, the average behavior of AUM over some periods and another window on the past of a single Darwin also about potential closures due to the Capacity Management Tool. I have not the time actually to study more this new feature, but from what I saw during the lunch over some Darwins there is probably another things highlighted in an official way, AUM grows more during HIGHS and during LOWS is the opposite, also on Darwins who seems to have a certain periodicity between UPs and DOWNs. I will not be amazed by a confirmation over a large sample of data and time frame, but i will do more research on it. 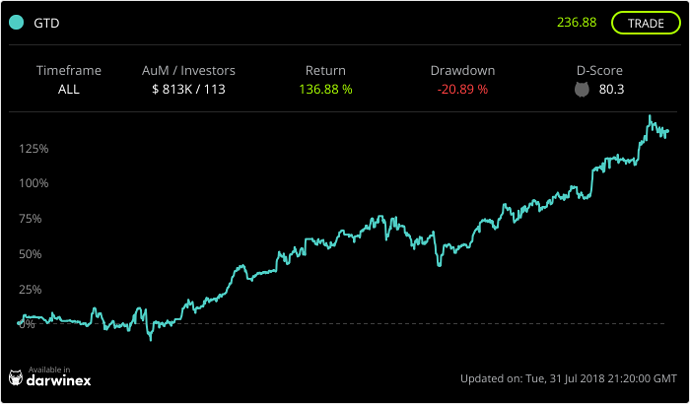 Hello Investors, that's the first weekly update for July about recent behavior of GTD. First Week has started not in the best way, checking the all I see just Markets not in alignment with most of my systems and a discharge of profit on some strategies that were performing very good in last quarters. During the week a bit of uncertainty on some pairs, some grey areas has amplified certain losses and of course there are no guarantee that those will continue or end in next days/week. Actually nothing is far from the common. However I still feel that some movements have truly short amplitudes and heights, some of these fake departures are boring me a little... during yesterday no big movements on pair traded even during the NFP and despite a lot of activity this week has concluded with a loss. A different picture on VRT which has currently ended the week with a +-1%. That's all for now, let's see the evolution of July since the month is still long and the semester just at its beginning. Thanks for New investors and also to Old ones, during this week many orders were taken. Just noticed, MOST INVESTORS filter on GTD. Thanks to all for the Trust, really thank you. Hello guys, that's the weekly update about recent moves on GTD. 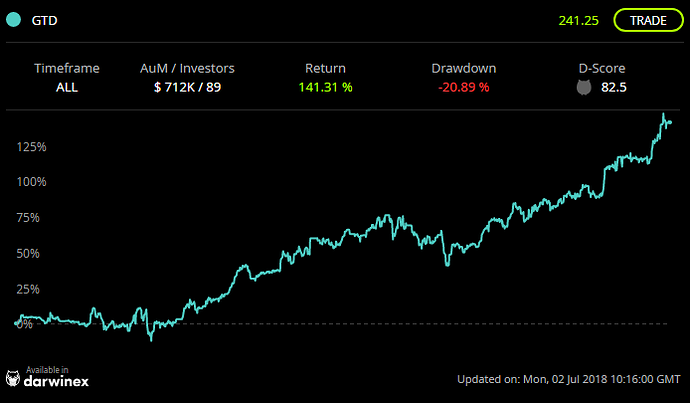 During the week a -1.74%. Actual replication for July is -3.81%. Certainly the week is not closing in the best way, even during these days the system has been trapped with different of its components by last market phases, in my opinion, on some pairs slightly unusual. Nevertheless it must be said that last movements can both be seen as unusual but also belong to the logic of some grey phases, and even if some of them are a bit rare, they are still a part of the whole. Losses were slightly boosted also by some of the components that were performing best during first semester of the year and despite some rather decent gains, the system is having a re-balancing of performance. Although we are about halfway through the month, it does not mean that things can get worse or better, chances for both as components monitors different phases and movements. Actually we have trading activity opened for the weekend, let's wait the evolution of this. 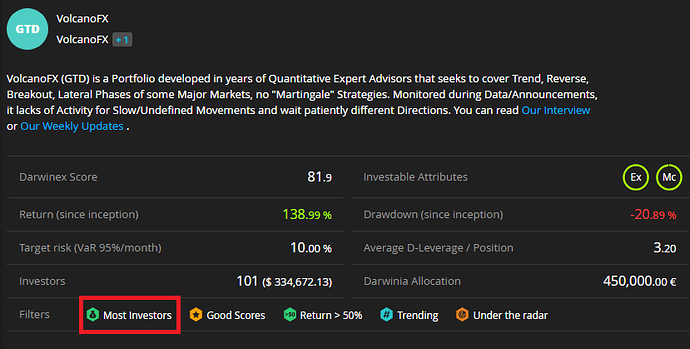 Thanks for the Trust, the system has actually both the "TRENDING" and the “MOST INVESTORS” filter! Any ideas why both curves are so similar? Hello Dear @fndoa , yes you are right, actually there is a bit of correlation between GLX and GTD, but GLX is also ours ! They are a bit correlated cause in the last period some components are catching similar movements, however the two portfolios even if shares something in common, on the long run takes different roads in particular way on some periods, and aims to a different return because of a different approach, a different trade-management, a different risk, traded pairs and components. These last ones are different both from approach both from techniques, which gives GLX a decent return and a certain cycle over the period but however has a shorter track-record in comparison to GTD. Hello Investors, that's the Weekly Update regarding Performance of GTD during previous week of July. This update comes out with a slight delay compared to the usual due to some contingencies that have committed me more than expected, however, some words to comment the week just passed. Although there was a partial recovery of the DD that had been on my Darwin, some situations could be exploited in a better way. Despite everything is nothing that goes beyond the expectations of some periods that exist and can not be avoided which in addition to being an intrinsic characteristic of some phases are also to be found in a discharge of performance of some systems that in some periods have have better performance and in others worse. Despite the rest, activities as usual when the market has allowed it and will continue to be if conditions permit it. There are other days that separate us from the end of July, possibilities to have a better/worse balance for the month. Thanks for the Trust, the system has still the "TRENDING" and the “MOST INVESTORS” filter! Hello Investors, here you will find some considerations more about last month faced by our Darwin GTD. Final replication of July is -2.27%. There are several things to say for this final balance of July even if I have told enough about it these past weeks. However, it should be emphasized that although the month ended with a negative percentage and the Darwin was in a DD phase, the general image must be seen. Some components had difficulty during the month, but these difficulties do not go totally to be found in a gray area that did not give breath to wide/long-lasting movements, they also depended, and I stress again, from a performance discharge of components on some pairs which, although they behaved in a more than decent way during the previous semester, a deflation phase also coincided during this month. The system has these phases, it is not possible to change them, it is not said that the next month will be better, it is not said that it will be worse. Analyzing the situation with substance, something makes me think that markets can easily exit from a certain immobility of movements that from the first half of June is affecting some pairs, moreover a decisive release may occur in the future but not necessarily shortly. In some cases during the past month, I was slightly amazed by a particular difficulty in taking some directions, in other cases the sudden/unexpected change in volatility that led to losses but not to a general change of direction. During the last week the Darwin has still faced some difficulties to follow the Market, in particular way on some pairs movements where too short and directions multiple and not exploitable at all. Even with some losses, different systems recovered a bit of pips but July will be remembered as a tricky month and for our Darwin just the time to do a little roller-coaster between loss-recovery. Thanks for their trust to investors who remained and decided to stay, the system despite everything is still among the most invested and trending. I have keeping GTD in a demo for a while and now planning to add to my real portfolio. Keeping a controlled and smooth evolution will certainly rewards on long term. Thank you. Dear @Epiphron thank you so much for your interest to have GTD on your real-portfolio, yes we believe more in something continuous rather than in something that lasts a little time, gutta cavat lapidem, even a drop of water if it falls continuously and uniformly digs the rock. Thank you another time, your comment was much appreciated, we will see the evolution. Dear @isabel03 , thank you for your interest. There are actually some reasons that are pushing us to not increase the equity of the underlying strategy. 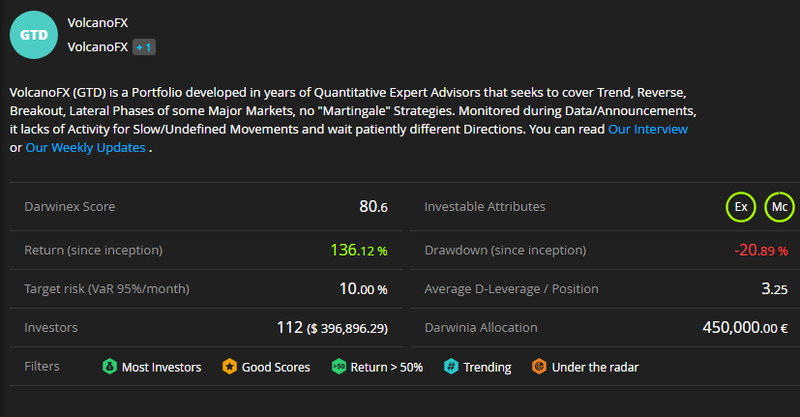 One of the reason is that we are actually acting as private investor of our self with our profiles on Darwinex, this since the beginning in some cases also to check divergence over the period with different amount/leverages/entries/exits on the quote. Actually we are still Investors of our-self since with time we have come to the conclusion that a Darwin can and is able to function properly and as similar to the Underlying if well managed and weighted, but with greater security from the point of view of the risk in case of any bad eventuality involving markets. Another reason is that after a period of study of the VaR, in some phases we act giving a bit and removing a bit of the equity in order to control the value always to favor the replication of our darwin GTD, and we actually prefear to have a smaller range to control in order to balance the equity when necessary in the easiest way possible, we feel more confortable doing this with small increasement/decreasment. Apart from this,the system is running on other private accounts we have and that are not only on Darwinex. there are also other questions we make in particular way when we observe our performance month by month/during particular events-news also on other Accounts where the system is running, but this is something we are evaluating in a private way and maybe we will face a discussions here if necessary. Obviously these are only personal considerations, nothing removes that there may be changes in the future. Hello Investors, that's a weekly update for GTD about last week. During the week a +0.76%. Replication of August is actually at +0.76%. Recovered a bit during the week but activity not at all since for some components there is still a bit of fog. During last days i was expecting a bit of movements more, in particular way with some Balances/Datas and during the NFP, these, unfortunately did not show up and the market seems to have jumped them without particular problems. Actually the engine has some trading activity for the weekend so we will see the evolution in some days. The system is the sixth trending Darwin of the platform, another time a big thank you for the trust. Hello Investors, here you'll find the last weekly update of GTD. During the Week some areas gave problems, I'm sure someone had the opportunity to look at the situation following it day by day. Activity on all the pairs traded by the portfolio, I was really surprised in some cases for the presence of really small and problematic directions, a continuation of a certain immobility that has been present for some days now. However, despite the risk level and the general alignment has not changed, during last part of the week, GTD took a way to recover the entire loss accumulated during previous days. Some components have reestablished their performance, others still have to work in order to restore a certain balance, but these phases are not preventable, they are part of the automatic system and several components, although in difficulty, could need to work long to restore certain circumstances or not necessary so long. BTW possibilities to have new trades by the end of the day and also during the weekend, activity as usual. This phase has given way to several new investors to enter, I appreciate your trust, thanks a lot. Great job on the recent EURUSD trade! I can see you are a very disciplined trader with solid risk management! Your trading system definitely have an edge! After almost a 2 months consolidation, I believe it's a good time to invest in GTD now! Your AUM is currently at 500k including DarwinIA. Do you experience slippage problem? Can we assume your trading results going forward will be similar like before?